Wonder is a function of the degree of resolution—in birdsong, in optics, in philosophy, in theology. Doug Ladd, until recently the Director of Conservation at Missouri Nature Conservancy, led us on a wide-ranging, foundational conversation on the meaning and biology of trees, and the abiding link between temperate forests and humans. Treeness, he argues, is best understood as a morphological definition of something that conferred advantage. Here, he skipped from tree to carnation to dandelion to draw out a point on adaptation, and the increased fitness through natural selection. The conversation took us through the ancient Quercus prelobata, oak fruits, cache trees of woodpeckers, green tree reservoirs, apical dominance, and cellular senescence, and forward through our own Quercus palustris and their native flatwood habitats. 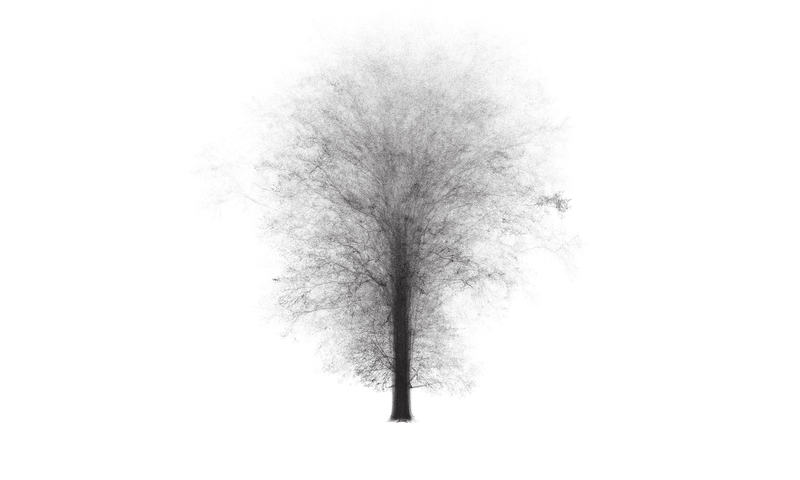 With an initial, deceptively simple prompt to construct a model of a tree, Doug in fact introduced into the discussion two questions: what is a tree, and what is a model. Here, the question of relationships–of the network of associations that allow something we call a tree to emerge in the first place–proved to be crucial. As we sketched and annotated our clumsy tree diagrams, questions of reproduction, fungal associations, structural stability, water and nutrient exchange, and habitat were all teased out of the conversation. The model of one tree quickly gave way to the idea of a vast biological system that happens to include a tree. I can accept it as a picture: a rigid pillar in a flood of light, or splashes of green traversed by the gentleness of the blue silver ground. I can feel it as movement: the flowing veins around the sturdy, striving core, the sucking of the roots, the breathing of the leaves, the infinite commerce with earth and air–and the growing itself in its darkness. I can assign it to a species and observe it as an instance, with an eye to its construction and its way of life. I can overcome its uniqueness and form so rigorously that I recognize it only as an expression of the law–those laws according to which a constant opposition of forces is continually adjusted, or those laws according to which the elements mix and separate. I can dissolve it into a number, into a pure relation between numbers, and eternalize it. Throughout all of this the tree remains my object and has its place and its time span, its kind and condition. But it can also happen, if will and grace are joined, that as I contemplate the tree I am drawn into a relation, and the tree ceases to be an It. The power of exclusiveness has seized me. This does not require me to forego any of the modes of contemplation. There is nothing that I must not see in order to see, and there is no knowledge that I must forget. Rather is everything, picture and movement, species and instance, law and number included and inseparably fused. Whatever belongs to the tree is included: its form and its mechanics, its colors and its chemistry, its conversation with the elements and its conversation with the stars–all this in its entirety. The tree is no impression, no play of my imagination, no aspect of a mood; it confronts me bodily and has to deal with me as I must deal with it–only differently. One should not try to dilute the meaning of the relation: relation is reciprocity. Does the tree then have consciousness, similar to our own? I have no experience of that. But thinking that you have brought this off in your own case, must you again divide the indivisible? What I encounter is neither the soul of a tree nor a dryad, but the tree itself. Removed from its community of trees, from the representational perfection of the allee, the oaks begin to emerge as the compromised, asymmetrical, imperfect beings that the always, already have been. Another kind of attention. Here, a hand drawn canopy projection. Centers de-centered. Measured symmetries. Hyphenated deviations. A crack in the sky. What kind of embrace? A becoming landscape that bears witness to time. When will it be time to let go? We might do well to argue up front that there is perhaps no such thing as one, single, isolatable tree—trees exist as intensely interconnected organisms that thrive and indeed require a range of mutualist associations through which energy, nutrients, and information is exchanged. An understanding of one tree quickly gives way to an understanding of the community of trees, and throughout the studio we will consistently interrogate the ways that our landscape imaginaries might be tuned to embrace this arboreal collectivity. Throughout the semester, we will use the allee as a laboratory—asking questions of the trees, asking questions of their context, and asking questions of ourselves.